• Charles Huerta: "I Have Never Been This Excited"
• AB Stands For "About Bankrupt"
• Was Virgil Hunter Looking For The DQ? 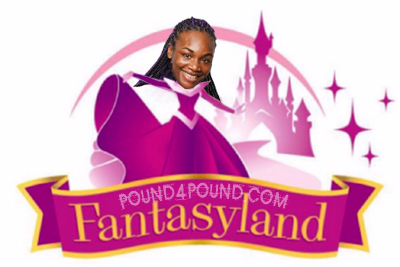 • Pound4Pound.com Is Now Lb4Lb.com Too! • He Likes It! Hey Mikey! MONTRÉAL - The Montrealer Colombian Oscar Rivas (26 -0-0), who is ranked in the Top 10 of the international ratings, will fight the WBC first contender, the heavyweight Dillian Whyte (25-1-0), July 20th in London, England. Tete: "Me And My Team Can Break You Into Pieces"
South Africa’s WBO World champion Zolani Tete (28-3, 21 KOs) is in a ‘good place’ and thanks Floyd Mayweather Sr. ahead of facing the WBC Diamond and WBA World champion, American-Philippine Nonito Donaire (39-5, 25 KOs), in the 118lb WBSS semi-final on April 27 at the Cajundome in Lafayette, LA, USA. “Preparations have been excellent for the fight,” said Tete before sending praise to legendary trainer Floyd Mayweather Sr., the father, and former trainer, of undefeated five-division champ Floyd Mayweather Jr.
Hasim Rahman KO'd Lennox Lewis in the 5th round to win the WBC, WBA and IBF Heavyweight Titles, "2001 Ring Magazine Upset of the Year". Lehlohonolo Ledwaba won a 12 round UD over Carlos Contreras to retain the IBF Super Bantamweight Title. Eddie Hopson KO'd Moises Pedroza in the 7th round to win the Vacant IBF Super Bantamweight Title. Arturo Gatti KO'd Tito Tovar in the 1st round. Danny Romero won a 12 round UD over Francisco Tejedor to win the IBF Flyweight Title. George Foreman won a 12 round MD over Axel Schulz to retain the IBF Heavyweight Title. Michael Moorer won a 12 round MD over Evander Holyfield to win the WBA and IBF Heavyweight Title. John Michael Johnson TKO'd Junior Jones in the 11th round to win the WBA Bantamweight Title. John John Molina won a 12 round UD over Gregorio Vargas to retain the IBF Super Featherweight title. 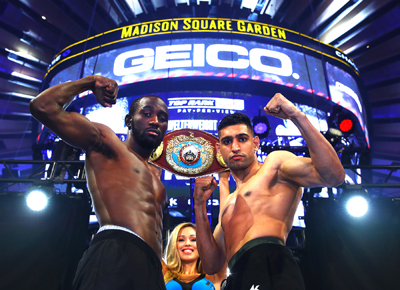 The pound-for-pound king, Terence “Bud” Crawford, will not need to relinquish his throne. 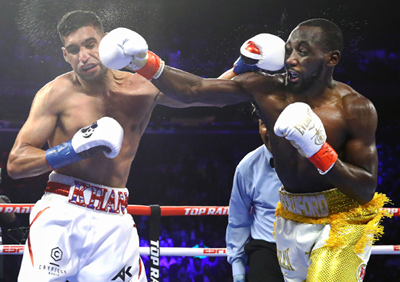 Crawford (35-0, 26 KOs) scored an unusual sixth-round TKO over Amir “King” Khan in front of 14,091 fans at Madison Square Garden to defend his WBO welterweight title for the second time. Lucian Bute KO'd Donnie McCrary in the 4th round - NABA Super Middleweight Title. Carl Froch TKO'd Henry Porras in the 8th round - Froch's American Debut. Alexander Gurov TKO'd Torsten May in the 8th round - Vacant European (EBU) Cruiserweight Title. Markus Beyer KO'd Manuel Lopez in the 7th round - WBC International Super Middleweight Title. Wilfredo Rivera won a 10 round UD over Angel Hernandez - Non Title. Hasim Rahman KO'd Steve Pannell in the 2nd round - USBA Heavyweight Title. Larry Donald won a 10 round UD over Ross Puritty - Non Title. Juan Manuel Marquez won a 12 round UD over Agapito Sanchez - WBO NABO Featherweight Title. On this night we were at the Doubletree Hotel in Ontario, CA. for the Thompson Boxing Promotions show, Locked ‘N Loaded. The main event this evening was between Erick “All American Boy” Ituarte (21-1-1, 3 KOs) and Jose “Hollywood” Estrella (20-16-1, 14 KOs). These two featherweights were scheduled to go 10 rounds. It has been almost a year since Ituarte has been in the ring to fight. Former lightweight world champion Robert “E-Bunny” Easter Jr. hosted a media day in his hometown of Toledo, Ohio Thursday and was joined by the Easter Bunny ahead of Sunday’s holiday. 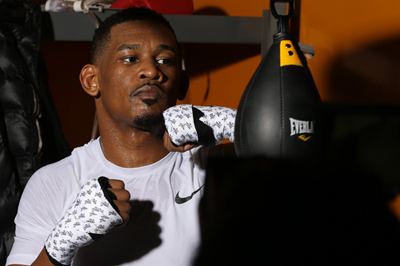 Easter will face former two-division champion Rances Barthelemy for the vacant WBA Lightweight Title on Saturday, April 27 live on SHOWTIME from The Chelsea inside of The Cosmopolitan of Las Vegas and presented by Premier Boxing Champions. Michael Trabant won a 12 round UD over Christian Bladt - European (EBU) Welterweight Title. Dariusz Michalczewski KO'd Joey DeGrandis in the 2nd round - WBO Light Heavyweight Title. Floyd Mayweather Jr. won a 12 round UD over Jose Luis Castillo - WBC Lightweight Title. Stevie Johnston won a 12 round MD over Alejandro Gonzalez - Non Title. Joe Calzaghe won a 12 round UD over Charles Brewer - WBO Super Middleweight Title. Joe Calzaghe TKO'd Mark Delaney in the 5th round - British Super Middleweight Title. Jean Baptiste Mendy won a 12 round UD over Lamar Murphy - Vacant WBC Lightweight Title. Virgil Hill won a 12 round UD over Lou Del Valle - WBA Light Heavyweight Title. Erick Ituarte, 125.3 lbs. vs. Jose Estrella, 125.7 lbs. Richard Brewart, 156.7 lbs. vs. Sergio Ramirez, 163.3 lbs. Luis Lopez, 145.3 lbs. vs. Daniel Perales, 146.9 lbs. Oscar Torrez, 214.4 lbs. vs. Thomas Hawkins, 253.6 lbs. Chris Crowley, 134.7 lbs. vs. Davonte McCowen, 131.1 lbs. Floyd Mayweather Jr. won a 12 round UD over Victoriano Sosa - WBC Lightweight Title. Miguel Cotto KO'd Joel Perez in the 4th round - Non Title. Danny Green KO'd Paul Smallman in the 8th round - Vacant IBF Pan Pacific Super Middleweight Title. Vic Darchinyan KO'd Prasob Nookliang in the 2nd round - Non Title. Johnny Bredahl KO'd Eidy Moya in the 9th round - WBA Bantamweight Title. Thomas Damgaard won an 8 round UD over Abdel Mehidi - Non Title Bout. Frankie Liles TKO'd Segundo Mercado in the 5th round - WBA Super Middleweight Title. Byron Mitchell TKO'd Guy Stanford in the 1st round - Non Title. Terron Millett TKO'd Tony Limones in the 3rd round - Non Title. 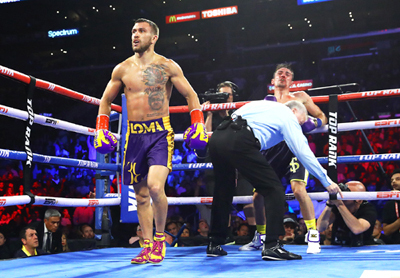 Israel Vazquez KO'd Joel Nolasco in the 2nd round - Non Title. The former IBF middleweight champion of the world, the Montrealer David Lemieux (40-4-0) injured his right hand in a training session Wednesday afternoon in Montréal, then, his WBA super middleweight elimination bout which was supposed to oppose him to the British John Ryder (27-4-0), has been officially cancelled. 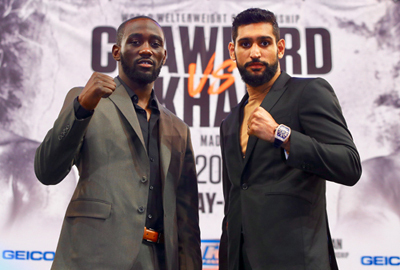 Crawford (34-0, 25 KOs) will defend his WBO welterweight title against Amir "King" Khan (33-4, 20 KOs) Saturday night at Madison Square Garden on the inaugural Top Rank on ESPN PPV (9 p.m. EST/6 p.m. PST). World ranked middleweight contender Sergiy "The Technician" Derevyanchenko (13-1, 10 KOs), of Brooklyn, NY, was victorious this past Saturday night, April 13, against former world title challenger Jack Culcay (25-4, 13 KOs), of Davie, FL, at the Minneapolis Armory in Minneapolis, MN, taking home a 12-round unanimous decision. 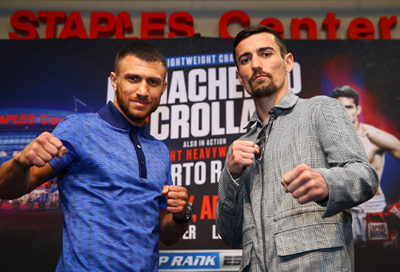 Scores for the bout, telecast nationally on FoxSports1, were 116-112 twice, and 115-113. 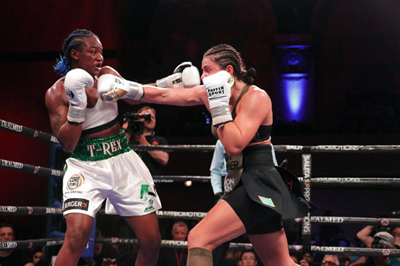 Undisputed Women’s Welterweight World Champion ‘The First Lady’ Cecilia Braekhus, (35-0, 9 KOs), is headed to the United States in May to commence training for her next fight in defense of all of her belts, (WBC, WBA, WBO, IBF, IBO and Ring Magazine). 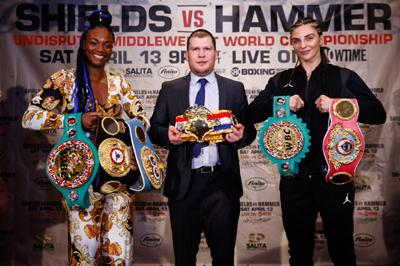 Based in Oslo, Norway, Braekhus has held all the world title belts in the welterweight division since September 2014. Yigit outpointed Mohamed Khalladi on February 16 at the CGM Arena in Koblenz following a brave attempt at the IBF World Super Lightweight title in his World Boxing Super Series Quarter-Final clash with Ivan Baranchyk. Carl Thompson won a 12 round UD over Chris Eubank - WBO Cruiserweight Title. Herbie Hide TKO'd Damon Reed in the 1st round - WBO Heavyweight Title. 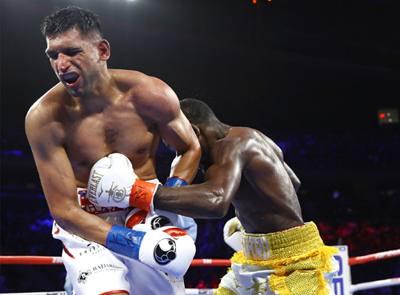 Naseem Hamed TKO'd Wilfredo Vazquez in the 7th round - WBO Featherweight Title. Ricky Hatton TKO'd Karl Taylor in the 1st round - Non Title. Junior Witter won a 6 round Decision over Jan Bergman - Non Title. Vitali Klitschko TKO'd Julius Francis in the 2nd round - Non Title. Antonio Diaz KO'd Alberto Cortes in the 2nd round - IBA Light Welterweight Title. Floyd Mayweather Jr. won a 10 round UD over Gustavo Cuello - Non Title. Oba Carr won a 10 round UD over Juan Carlos Rodriguez - Non Title. Diego Corrales KO'd Juan Carlos Salazar in the 1st round - Non Title. Ike Quartey TKO'd Ralph Jones in the 5th round - WBA Welterweight Title. Junior Jones won a 12 round UD over Marco Antonio Barrera - WBO Super Bantamweight Title. Joel Casamayor TKO'd Francisco Valdez in the 4rd round Non Title. It's a whole new ballgame for boxing's pound-for-pound superstar attraction GENNADY "GGG" GOLOVKIN! Golovkin (38-1-1, 34 KOs), from Karaganda, Kazakhstan, brings his Big Drama Show back to the "Mecca of Boxing" -- Madison Square Garden for the first time in over two years in his eagerly-awaited DAZN debut on Saturday, June 8. Golovkin, whose resume includes a record 20 consecutive middleweight title defenses (18 by way of knockout), has consistently drawn packed houses to the five previous events he has headlined at The Garden, dating back to 2013. 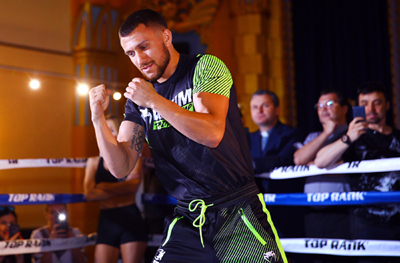 He will rumble with undefeated Top-10 contender and Kronk Gym alumnus STEVE ROLLS (19-0, 10 KOs), from Toronto, Canada, in a battle, scheduled for 12 rounds, at a maximum weight of 164 lbs. Golovkin vs. Rolls kicks off the exclusive six-fight, three-year global partnership between GGG Promotions and DAZN, the world's fastest-growing sports streaming platform. World Boxing Organization (WBO) No. 1-ranked contender "Mighty" Aston Palicte (25-2-1, 21 KOs)will face three-division world champion Kazuto Ioka (23-2, 13 KOs)for the vacant WBO Junior Bantamweight World Championship, June 19 at Osaka Orefectural Gym in Osaka, Japan. Undefeated NABF Women's lightweight champion, Selina "Aztec Queen" Barrios (5-0, 2 KOs), returns to the ring April 27, 2019, against former world champion, Melissa "The Shark" Hernandez (22-7-3, 7 KOs). The six-round bout will take place at the Cajundome in Lafayette, LA, as a special feature attraction on the WBSS super-lightweight semi-final card, headlined by Regis Prograis (23-0, 19 KOs) vs. Kiryl Relikh (23-2, 19 KOs). John Ruiz TKO'd Fres Oquendo in the 11th round - WBA Heavyweight Title. Chris Byrd and Andrew Golota fought to a 12 round DRAW - IBF Heavyweight Title. Wayne Braithwaite won a 12 round UD over Louis Azille - WBC Cruiserweight Title. Jose Navarro won a 12 round UD over Jorge Luis Gonzalez - IBA Continental Super Flyweight Title. Mike Anchondo TKO'd Roque Cassiani in the 10th round - Non Title. Librado Andrade KO'd Errol Banner in the 2nd round - Non Title. Jorge Arce TKO'd Salvatore Fanni in the 6th round - WBO Light Flyweight Title. Shane Mosley TKO'd John Brown in the 8th round - IBF Lightweight Title. Angel Manfredy won a 10 round UD over Ivan Robinson - Non Title. Jose Luis Castillo TKO'd Julio Cesar Leon in the 8th round - Mexican Featherweight Title. 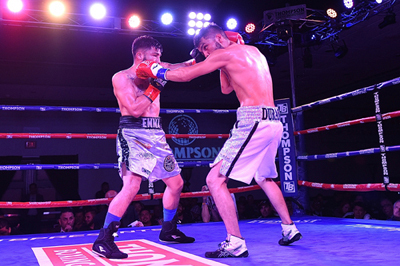 Ben Tackie KO'd Edwin Santana in the 10th round - Vacant IBA Americas Lightweight Title. Wayne McCullough won a 10 round UD over Antonio Salas - Non Title. Sam Soliman TKO'd Moechrody in the 3rd round to retain the IBF Pan Pacific Middleweight Title. Vic Darchinian TKO'd Falazona Fidal in the 2nd round. Carl Froch TKO'd Michael Monaghan in the 3rd round. Herbie Hide TKO'd Derek McCafferty in the 7th round. Kennedy McKinney won a 12 round MD over Welcome Ncita to retain the IBF Super Bantamweight Title. Marlon Staring retained his WBA Welterweight Title when he and Mark Breland fought to a 12 round Draw. Julio Cesar Chavez TKO'd Rodolfo Aguilar in the 6th round to retain the WBA Lightweight Title. Sugar Ray Robinson KO'd Rocky Graziano in the 3rd round to retain the World Middleweight Title. Darius Michaelczewski TKO'd Graciano Rocchigiani in the 10th round to retain the WBO Light Heavyweight Title. Fernando Vargas won a 12 round UD over Ike Quartey to retain the IBF Light Middleweight Title. Vuyani Bungu TKO'd Pablo Osuna in the 2nd round to retain the IBF Super Bantamweight Title. Marvin Hagler TKO'd Thomas Hearns in the 3rd round to retain the WBC, WBA and IBF Middleweight title in the Ring Magazine Fight of the Year. Milt McCrory TKO'd Gilles Elbilia in the 6th round to retain the WBC Welterweight Title. Eusebio Pedroza TKO'd Cecilio Lastra in the 13th round to win the WBA Featherweight Title. Salvador Sanchez won a 10 round decision over Juan Escobar (Sanchez down twice). Bernard Hopkins won a 12 round UD over Keith Holmes - WBC, IBF Middleweight Title. Nelson Dieppa KO'd Andy Tabanas in the 11th round - Vacant WBO Light Flyweight Title. Serguei Lyakhovich won an 8 round UD over Sedrick Fields - Non Title. Andrew Golota KO'd Eli Dixon in the 6th round - Non Title. Zab Judah KO'd Angel Beltre in the 2nd round - Non Title. Micky Ward KO'd Mark Fernandez in the 3rd round - Non Title. Eric Harding won a 6 round Decision over Levan Easley - Non Title. Vivian Harris KO'd Carlos Nevarez in the 1st round - Non Title. 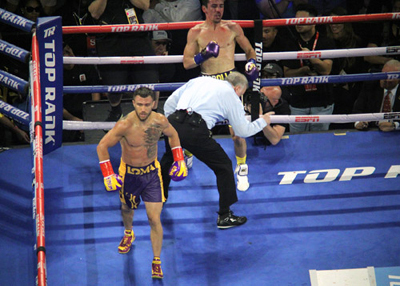 Daniel Zaragoza won a 12 round UD over Joichiro Tatsuyoshi - WBC Super Bantamweight Title. 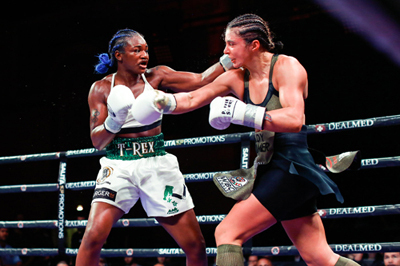 Michelle Piccirillo won a 12 round UD over Cory Spinks - Vacant IBF Welterweight Title. Silvio Branco won a 6 round decision over Ramdane Serdjane - Non Title. David Tua TKO'd Fres Oquendo in the 9th round - NABF Heavyweight Title. Ray Austin and Lance Whitaker fought to a 10 round DRAW. Tim Witherspoon TKO'd Danny Wofford in the 3rd round - Non Title. Librado Andrade KO'd Terry Smith in the 2nd round - Non Title. Sam Soliman won a 6 round decision over Paul Wesley. Sven Ottke TKO'd Jason Hart in the 2nd Round - Non Title. Timo Hoffman won a 6 round decision over Mike Robinson. Markus Beyer TKO'd Isidore Janvier in the 5th round - Non Title. Dana Rosenblatt KO'd Howard Davis Jr. in the 2nd round - WBU Middleweight Title. Micky Ward KO'd Louis Veader in the 9th round - WBU Middleweight Title. Derrick Gainer won a 12 round SD over Oscar Leon to Retain the WBA Featherweight Title. Marco Antonio Barrera TKO'd Kevin Kelley in the 4th round. Cruz Carbajal TKO'd Steve Dotse in a Bantamweight Bout. Oscar De La Hoya won a 12 round UD over Pernell Whitaker to win the WBC Welterweight Title. Paulie Ayala won a 10 round Decision over Nestor Lopez. Micky Ward KO'd Alfonso Sanchex in the 7th round. Floyd Mayweather Jr. KO'd Bobby Giepert in the 1st round. Raul Marquez TKO'd Anthony Stephens in the 9th round to win the Vacant IBF Light Middleweight Title. Cesar Soto KO'd Elias Quiroz in the 2nd round. Vassiliy Jirov TKO'd Tyrone Armstead in the 4th round. Ike Quartey TKO'd Vince Phillips in the 3rd round to retain the WBA Welterweight Title. Sean O'Grady won a 15 round UD over Hilmer Kenty to win the WBA Lightweight Title. Terdsak Jandaeng won a 12 round UD over Jesse Maca - WBO Asia Pacific Featherweight Title. Anthony Bonsante TKO'd Marris Virgil in the 3rd round - Non Title. O'Neil Bell KO'd Mohammad Benguesmia in the 4th round - Non Title. David Telesco TKO'd Ernest Mateen - New York State Light Heavyweight Title. James Butler KO'd Gerald Holmes in the 1st round - Non Title. Hector Camacho TKO'd Wilbur Garst in the 7th round - Non Title. Sharmba Mitchell KO'd Gilberto Flores - WBC Continental Americas Light Welterweight Title. Ike Ibeabuchi KO'd Gary Butler KO'd Gary Butler in the 1st round - Non Title. Zeljko Mavrovic TKO'd Christophe Bizot in the 11th round - Vacant European (EBU) Heavyweight Title. Winky Wright won a 10 round Decision over Leon Cessiron - Non Title. In Jin Chi KO'd Michael Brodie in the 7th round - Vacant WBC Featherweight Title. Jamie Moore TKO'd Adam Katumwa in the 5th round - Commonwealth (British Empire) Light Middleweight Title. Cory Spinks won a 12 round UD over Zab Judah - WBC, WBA, IBF Welterweight Title. Lakva Sim TKO'd Miguel Callist in the 5th round - Vacant WBA Lightweight Title. Mohammad Abdulaev TKO'd Jesse Feliciano in the 8th round - WBO Inter-Continental Light Welterweight Title. Lamon Brewster TKO'd Wladimir Klitschko in the 5th round - Vacant WBO Heavyweight Title. Irene Pacheco KO'd Luis Coronado in the 9th round - Vacant IBF Flyweight Title. Jose Garcia won a 12 round SD over Noel Arambulet - WBA Fedelatin Minimumweight Title. Naseem Hamed TKO'd Paul Ingle in the 11th round - WBO Featherweight Title. Thomas Hearns won a 12 round UD over Nate Miller - Vacant IBO Cruiserweight Title. 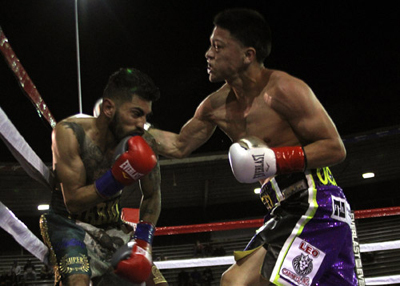 Oscar Larios TKO'd Miguel Escamilla in the 10th round to retain the Mexican Super Bantamweight Title. Tracy Harris Patterson won a 12 round UD over Richard Duran to retain the WBC Super Bantamweight Title. Pernell Whitaker won a 12 round UD over Santos Cardona to retain the WBC Welterweight Title. Buddy McGirt won a 12 round UD over Livingstone Bramble. Gianfranco Rossi TKO'd Angel Hernandez in the 6th round to retain the IBF Light Middleweight Title. Evander Holyfield TKO'd Carlos DeLeon in the 8th round to unify the WBC, WBA, and IBF Cruiserweight Titles. Meldrick Taylor TKO'd Ivan Gonzalez in the 5th round. Sornpichai Kratingdaenggym TKO'd Gilberto Gonzalez in the 5th round to win the WBA Flyweight Title. Uriah Grant TKO'd Thomas Hearns in the 2nd round to retain the IBO Cruiserweight Title. Hearns injured his ankle. Felix Trinidad TKO'd Roger Turner in the 2nd round to retain the IBF Welterweight Title. Oliver McCall won a 12 round UD over Larry Holmes to retain the WBC Heavyweight Title. Luis Santana retained the WBC Light Middleweight Title when Terry Norris was DQ'd for hitting after the bell. Norris lost the title to Santana by being DQ'd in their previous bout. Finally in their 3rd bout Norris regained the title by TKO'ing Santana in the 3rd round. Bruce Seldon TKO'd Tony Tucker in the 7th round to win the Vacant WBA Heavyweight Title. Julio Cesar Chavez won a 12 round UD over Giovanni Parisi to retain the WBC Light Welterweight Title. Julio Cesar Vasquez won a 12 round UD over Ricardo Raul Nunez to retain the WBA Light Middleweight Title. Yory Boy Campas KO'd Rigoberto Placenia in the 2nd round - WBC Mundo Hispano middleweight Title. Fernando Velardez TKO'd Juan Carlos Ramirez in the 6th round - Non Title. Omar Sheika TKO'd Stephane Ouellet in the 2nd round - Non Title. Jermaine Taylor TKO'd Kenny Stubbs in the 2nd round - Non Title. Terrance Cauthen won a 10 round UD over Jose Narvaez - Non Title. 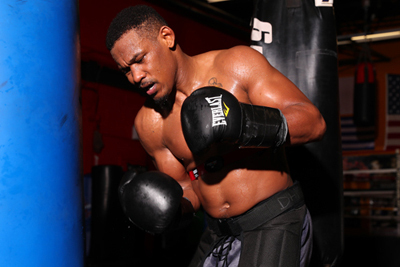 Antwun Echols TKO'd Kevin Tillman in the 8th round - NABF , USBA Middleweight Titles. Jimmy Thunder won a 10 round UD over Tim Witherspoon - Non Title. Have a Betfair promo code to bet on football matches, or find other betting promotion codes on our site. time-proven site with thousands of fans. Check our list of the best online casinos UK. Only the most generous, trustworthy and fun casinos go through our expert reviews so you can play and enjoy. you to cash out in-play. to play these games from. Online casinos have become popular in the United States. You can play your favourite casino games by visiting https://www.casinous.com today. with no risk on your side! look no further. Newbettingsites.uk lists and compares the best New Mobile Betting Sites which offer competitive boxing odds. Floyd Mayweather Open Workout In B&W By Bret The "Threat"
Click Here For All Photo By Bret "The Threat"